Making compost is the single best thing you can do for your garden because it adds organic matter to the soil. When I was growing up I often spent muggy afternoons with my grandmother after school tucked away in the back of her garden, cutting twigs into small pieces for the compost pile. I never grasped the importance of what we were doing as a kid but loved chatting with her until the sun dipped below the horizon. As I grew older, I grew to appreciate my grandmother's productive garden. Her hydrangeas always bloomed, her plump tomatoes grew on sturdy vines, and weeds were never a problem. The secret to her success was the compost we made from those twigs, plus garden clippings, leaves and food scraps. "Making compost is the single best thing you can do for your garden." Making compost is the single best thing you can do for your garden because it adds organic matter to the soil. Without compost, soil would be dirt, the stuff you drag into your house when you forget to take off your shoes. Soil, on the other hand, is our life support system. It anchors plant roots, creates habitat for millions of critters, filters water and holds nutrients. Life without healthy soil would be nearly impossible. I love to grab a handful of silky rich compost and let it slip between my fingers. One handful of this amazing organic material contains more soil dwellers than people on Earth, from the tiniest microscopic decomposers to nutrient recycling nematodes to soil-moving earthworms. These creatures use carbon-rich organic matter as energy and, in the process of eating, release valuable nutrients like nitrogen into the soil. They also help trap carbon underground as they turn everyday food scraps into fertile humus, one of the best fertilizers you can use. If your garden has soil that is either sandy or dense with clay, mixing compost into the first three inches is enough to bring it around and make it healthy. Compost is so rich it actually has to be used sparingly in certain cases. It can shrivel the leaves of young seedlings, for instance, so I've learned to resist adding it to new plantings. Store-bought fertilizers are expensive but compost is always free. In fact, if you have to pay to get your trash hauled away, composting can save you money by reducing the amount of waste you throw out. 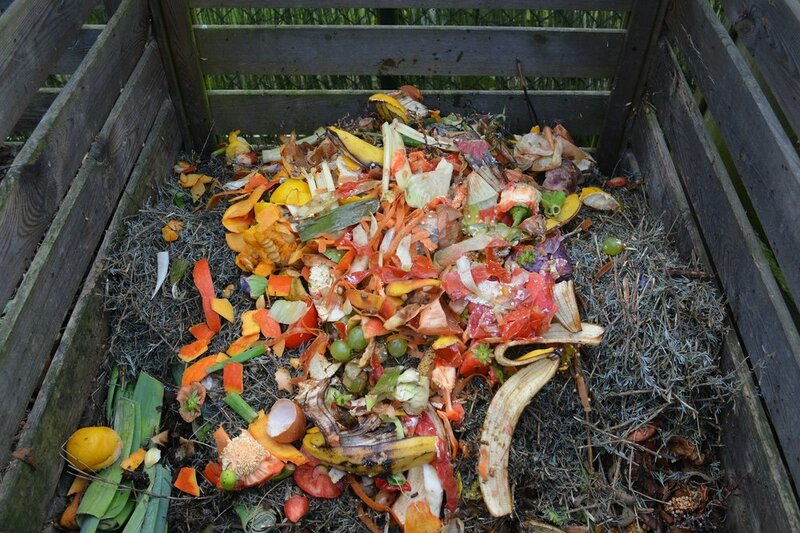 Composting is, of course, a much healthier alternative to tossing food in landfills. So are you ready to take the plunge and start your own compost pile? It’s easy to do and you’ll be rewarded with healthy plants. Choose your bin. A compost bin can be made from anything. Maybe you don’t have a big yard, or perhaps you have no yard at all. No matter. You can compost in closed bins or yard waste bags that can easily be moved around or tucked into the corner of a porch, balcony, or garage. Make your own bin or buy one from your local garden store. Choose a bin based on what you want to compost and how much space you have. The best containers are divided into at least two spaces so you can add green waste to one side and leave the waste on the other to decompose. An open style compost bin with supportive wooden walls. I prefer not to use a bin and build an open pile instead, but that’s because I have lots of room. I give my pile some structure by stacking hay bales in the shape of a U, a single layer thick and two bales high. Then I shovel my compost into the U. I prefer leaving my compost on the ground instead of lining my pile with plastic, so worms and other soil creatures can access the compost freely and help to decompose the material more quickly. Learn what to compost. I keep a covered bowl or bin in my kitchen to collect food scraps so it’s easy to add them to the pile once a week. Almost anything goes, except for oils, bones, meat, and dairy products, which can attract large pests to your outdoor pile. Throughout the spring and summer I collect all of my yard waste, like grass clippings, leaves, and garden debris, to add to my pile. In the fall, I have neighbors drop off fallen leaves so I always have a good supply of carbon rich materials to layer into my compost. Never compost diseased plant clippings or weeds that have gone to seed; you’ll just end up spreading disease and weeds. Here's a handy guide to the strange assortment of items you can compost - egg shells, of course, but cotton balls and dryer lint? It's pretty surprising the material you can use to create good soil. Pick a location. Before starting to put your food waste to work, pick a good place for it. You want a place that’s out of the way but still convenient enough to get to easily. I keep my compost pile hidden behind the garage so I can toss food scraps from dinner without having to trek through the snow, wind, or rain. The added shade from the house also helps to protect my pile from the intense summer sun, and keep it from drying out. Layer on your organic waste. Building a compost pile can be a little intimidating but it doesn't have to be. I follow these simple rules. Build a good foundation. No matter which container you choose, start your compost with a layer of small twigs or straw on the bottom to help aerate and drain it. This helps prevent your pile from turning slimy and mucky on the bottom. Chop or shred organic waste so it can decompose faster. Chop large or woody garden debris, like branches and perennial trimmings, into smaller pieces before throwing them onto the pile. Use pruners or shears to chop any cuttings larger than a half inch in diameter. Shred debris that easily mats together, like leaves and newspaper. Matted material can prevent water and air from reaching the center of your pile, and turn your compost slimy and stinky. Add equal parts brown to green materials. 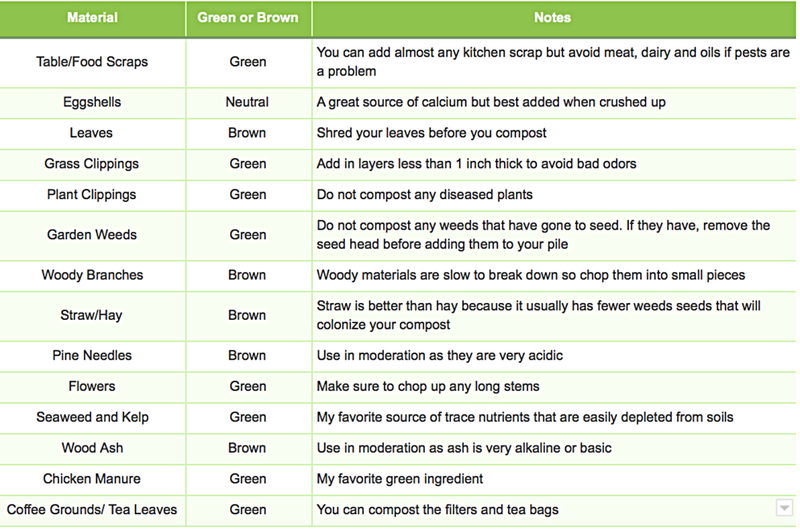 You can’t make great compost solely from brown leaves or green grass clippings. It’s the mixture of the two, the carbon to nitrogen ratio, that activates hard working soil microbes. When I start a new pile I begin with a a layer of brown material, like leaves, straw and wood ash, followed by a layer of green material, like grass, garden clippings, weeds, and food scraps. Let it sit. Once you have five to six layers of alternating green and brown materials, cover the whole thing with straw, and let it sit. Turn the pile. The easiest way to make compost is to do nothing. I usually let mine sit all winter and by spring I have a good pile of rich and dark compost. Most compost experts recommend turning your compost pile at least twice a month, but who has time for that? The secret to great compost is how you build your pile. That said, if you notice your pile is cold and slimy, go ahead and turn it over by using a pitch fork to bring the bottom of the pile to the top where it will aerate and break down faster. Not sure what to compost? Here is a list of the best compostable materials. You want your compost pile to heat up. That's a sign microbes are dining on your waste. A healthy compost pile has an ideal temperature of 150 degrees. If you live in a cold area make sure your pile is at least four feet wide and four feet tall so it can stay warm enough in the winter to protect the hard working worms and soil organisms that convert your scraps into black garden gold. You want compost that's a rich, dark brown color and has an earthy smell. But even lighter brown compost is okay to use. Go ahead and dress your perennial plants each spring with a generous layer of it. Not only does it nourish the soil, it acts as a nice mulch too. What happens when your compost is slimy, infested with bugs, or producing a gut- wrenching smell? The beneficial bacteria that break down your compost need air to turn your yard waste into gold. Poor aeration and low oxygen levels allow anaerobic bacteria to take over. Anaerobic bacteria don’t need oxygen to thrive and can still decompose your green waste but much more slowly, as long as two to three years. You can speed up the rate of decomposition by shredding materials before you add them, regularly turning your pile, and making sure you have a good layering system of brown carbon to green nitrogen rich materials. Even perfect compost can attract large pests like rodents and raccoons, especially in urban settings. For them your compost pile is an all-you-can-eat buffet. It’s why most gardeners choose to use a covered container. It’s also the reason many towns require compost piles to be fully enclosed. Make sure to check out your local regulations. Dry summers pose a threat to a healthy compost pile. When rain is scarce, compost piles become too dry and dusty for decomposition. Dry piles can’t support a healthy ecosystem of bacteria and your pile will remain inactive until the rains return. You can help your pile through dry spells by watering it. When it's hot outside, I use a spinning sprinkler and leave it on for about an hour once a week to mimic a rain storm, checking to see when the center of the pile is moist. If your pile doesn't come back to life after watering it, it might be low in nitrogen. Dig a big hole in the center of your pile and fill it with grass clippings, which are rich in nitrogen, before covering it back up. The combination of water and additional nitrogen can jumpstart any pile back to life. Even hot piles can sprout unwanted seeds. Thankfully, it’s easy to pull weeds out of loose compost and toss them back into the pile. But if you have a lot of weeds sprouting in your pile, mulch the top of your pile with straw or newspaper. Note: Once in the while I get some happy surprises. When I see baby squashes and tomatoes pop up in my warm compost I dig them out and transplant them into my garden or share them with my neighbors. The worst composting headache is the terrible smell of ammonia that makes your neighbors cringe when strong winds prevail. If you have a smelly compost pile, you're sure to be the talk of the neighborhood and not in a good way. So be aware that compost containing too much green, nitrogen-rich materials, like grass or garden clippings, will become stinky and slimy. Avoid this problem by properly layering your brown and green materials. Acadia Tucker is a New Hampshire-based farmer and gardener, and author of Growing Perennial Foods: A guide to raising resilient herbs, fruits, and vegetables (Stone Pier Press, Spring 2019) and Growing Good Food: A citizen's guide to backyard carbon farming (Stone Pier Press, Fall 2019). This is part of our series on radical gardening, or how to grow food to help the planet. To find out more about growing your own perennials, see our Perennial Profiles.